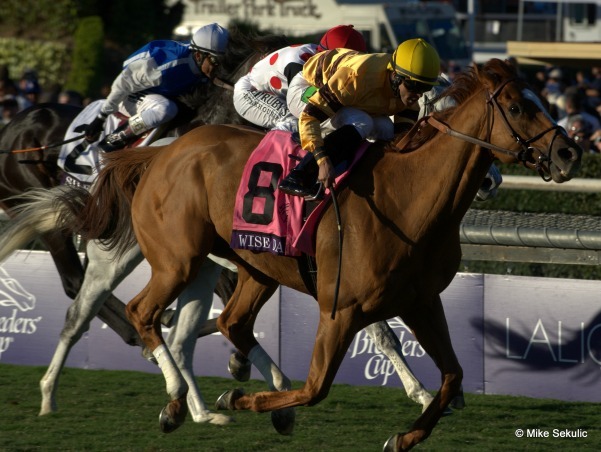 Over the last 20 years, Wise Dan has been one of the most popular horses to grace the American horse racing industry. Despite an occasional (see 2012, 2014, & 2015) injury that takes him out of training, "Dan the Man" has amassed an amazing race record of 31-23-2-0 and earnings of $7,552,920. Like a well-oiled machine, he has thrilled racing fans over the last four years. As a classic miler that competes against the best turf-milers in the world, Wise Dan's record is made all the more impressive. He made his first turf start on July 4, 2011 in the Grade II Firecracker at Churchill Downs and won the race easily. Since that point in time, he has run on turf a total of 16 times winning 15 of those races. His only loss since August 11, 2012 was and off-the-turfer where he finished second to Silver Man in the Grade I Shadwell Mile at Keeneland on an artificial surface. In the process, he earned "Horse of the Year," "Champion Older Male Horse" and "Champion Male Turf Horse" titles two years running (2012 & 2103). Sadly, he was on track in 2014 to win the same three titles for the third straight time before an ankle injury forced him to the sidelines before the Breeders Cup Mile. After spending eight months on the sidelines, racing fans were recently treated to the news that Wise Dan is back in training with high hopes of racing in the Breeders Cup Mile later this year at Keeneland. As recently reported by trainer Charlie LoPresti, the horse has been back at the track since late May and has resumed jogging on a daily basis. After 30 days of jogging, he will be reevaluated before he continues on preparing for a race. At 8-years-old, it would be an amazing feat for him to come back from a serious injury and still be able to compete against the best horses in training. That said, 'Dan The Man' might be the only horse to run in the last 10-15 years that could actually pull it off. There's no doubt he has racing fans hoping and praying he does. If Wise Dan was to make it to the Breeders Cup, racing fans could be in for one of the greatest days in American horse racing history. The prospects of the horse running in the Breeders Cup Mile on the same day that 2015 Triple Crown hero American Pharaoh faces-off against 2014 Kentucky Derby/Preakness winner California Chrome in the Breeders Cup Classic would be more than a normal horse player could handle. But before anyone gets ahead of themselves, Wise Dan still has a few hurdles. First, he cannot afford any interruptions in his training regimen from this point on. Secondly, he would almost assuredly need a prep race, perhaps in the Shadwell Turf Mile-G1 at Keeneland in early October. Finally, he would need to look the part before his connection would throw him in against the best turf-milers in the world. If Wise Dan were to win the Breeders Cup mile followed by a victory by American Pharoah in the Breeders Cup Classic, racing fans might be looking at the possibility of saying goodbye at the same time to two of the greatest thoroughbreds in horse racing history. What a bittersweet moment that would be. Horse racing is filled with high and lows. Here's to wondering if the horse racing public is ready for the highest of highs and lowest of lows all on the same day. As the Breeders Cup gets near, racing fans should be trolling online racebooks doing odds comparisons for the best odds on the future book. By shopping early, gamblers stand a better chance of scoring the best odds available. In the coming weeks, checking out odds comparisons can also be useful during key prep races.